This is an extended four bedroomed detached dormer bungalow positioned in this popular village of Welton, close to the popular school of William Farr. The property has been substantially improved by the current owners and has internal accommodation to comprise of Entrance Porch, Reception Hallway, Three Ground Floor Bedrooms, Bathroom, Kitchen, Dining Room and stairs to the First Floor Landing leading to First Floor Lounge with views over open fields, WC, Bedroom 4 with En-suite. Outside there is a garden and ample off road parking to the front of the property giving access to the Integral Garage and to the rear of the property there is a further Detached Garage and extensive well-stocked and mature garden backing onto countryside. Viewing of the property is highly recommended to appreciate the accommodation on offer. LOCATION Welton is a popular village which lies to the north of the historic Cathedral and University City of Lincoln. The village has a wide range of local amenities including schools, shops and public houses. There is also a regular bus service out of the village into Lincoln City Centre. ENTRANCE PORCH 5′ 11" x 6′ 1" (1.8m x 1.85m) , with UPVC windows and door to the front aspect, radiator, tiled flooring, wall lights and door to the reception hallway. RECEPTION HALLWAY With stairs to the first floor landing and doors to bedrooms 1, 2 & 3, kitchen, family bathroom and dining room. BEDROOM 1 11′ 6" x 13′ 3" (3.51m x 4.04m) , with UPVC window to the front aspect and radiator. BEDROOM 2 13′ 11" x 7′ 6" (4.24m x 2.29m) , with UPVC window to the front aspect and radiator. BEDROOM 3 8′ 11" x 9′ 5" (2.72m x 2.87m) , with UPVC window to the side aspect, fitted wardrobes and radiator. KITCHEN 11′ 6" x 12′ 8" (3.51m x 3.86m) , with UPVC window and door to the rear garden, fitted with a range of base units and drawers with work surfaces over, wall mounted units with complementary tiled splashbacks and spaces for cooker, fridge and washing machine. BATHROOM 7′ 6" x 6′ 11" (2.29m x 2.11m) , with UPVC window to the rear aspect, suite to comprise of corner bath with shower over, WC and wash hand basin, partly tiled walls and a towel radiator. DINING ROOM 13′ 3" x 10′ 4" (4.04m x 3.15m) , with UPVC sliding doors to the rear garden and radiator. 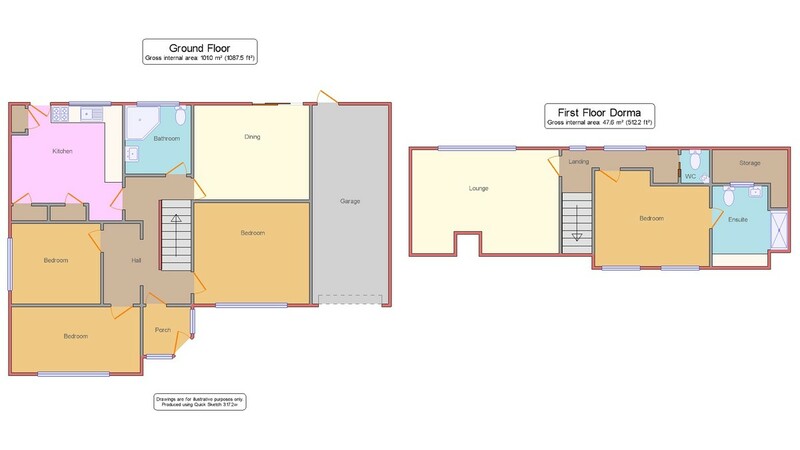 FIRST FLOOR LANDING With radiator and doors to lounge, WC and bedroom 4. LOUNGE (FIRST FLOOR) 16′ 11" x 11′ 9" (5.16m x 3.58m) , with UPVC window to the rear aspect with views over open fields, gas fire, loft storage and radiator. BEDROOM 4 11′ 4" x 13′ 4" (3.45m x 4.06m) , with two Velux windows to the front elevation, loft storage, radiator and door to the en-suite. EN-SUITE 9′ 3" x 6′ 2" (2.82m x 1.88m) , with Velux window to the rear aspect, suite to comprise of walk-in shower, WC and wash hand basin, radiator, loft storage, partly tiled walls and tiled floor. OUTSIDE To the front of the property there is a blocked paved driveway providing off road parking and giving access to the integral garage, a lawned garden and mature shrubs, trees and a hedge to the front. To the rear of the property there is a paved seating area, lawned garden, mature shrubs and trees, vegetable plots, greenhouse and paved seating areas. INTEGRAL GARAGE 22′ 5" x 9′ 5" (6.83m x 2.87m) , with electric roller door to the front aspect, door to the rear, power and lighting. REAR DETACHED GARAGE 16′ 10" x 10′ 0" (5.13m x 3.05m) , with door to the front aspect, power and lighting.